A new exhibition at London's Victoria and Albert Museum has brought together more than 100 Hollywood costumes, from Darth Vader's suit to Dorothy's famous ruby slippers. The show aims to tell the story of the process of costume design and how it helps create believable characters, curators said Tuesday. "It's not really about the clothes - it's really about creating an authentic individual, every time," said guest curator Deborah Landis, who has designed costumes for movies including "The Blues Brothers." Many of cinema's most legendary outfits are here: Charlie Chaplin's baggy suit, hat and cane ensemble; Holly Golightly's black Givenchy gown from "Breakfast at Tiffany's;" Scarlett O'Hara's green velvet dress from "Gone with the Wind;" and Indiana Jones' leather jacket and fedora from "Raiders of the Lost Ark." 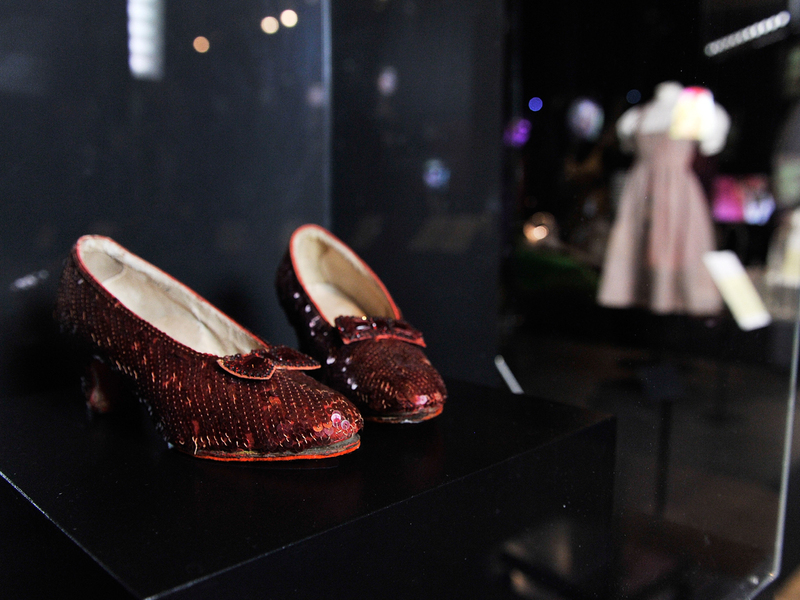 Among the show's highlights are the ruby slippers and blue-and-white gingham pinafore worn by Judy Garland in "The Wizard of Oz," which were united for the first time since the 1939 movie was filmed. The slippers are on loan from the Smithsonian's National Museum of American History in Washington. The exhibition is divided into three "acts," according to the museum's website - Act 1 is "Deconstruction" (the costume designer's creative process and research), Act 2 is "Dialogue" (the collaboration between costume designers and filmmakers) and Act 3 is "Finale" (a " a celebration of Hollywood heroes, villains and femme fatales"). The museum's assistant curator, Keith Lodwick, said his team spent five years on a worldwide treasure hunt, borrowing the costumes from museums, collectors and film studios. There were plenty of glamorous gowns from Hollywood's best-known screen sirens: Marilyn Monroe's white halter-neck dress from "The Seven Year Itch;" Elizabeth Taylor's floor-length cream gown from "Cleopatra;" and the purple evening dress worn by Barbra Streisand in "Funny Girl." But Lodwick said the exhibition also included some unusual choices to surprise viewers expecting just outlandish sci-fi outfits and elaborate period costumes. "All movie costumes, no matter the genre, are always meticulously researched," Lodwick said. Matt Damon's casual outfit in the "Bourne Identity" action movies, for example, may "look just like a jacket and shirt, but it was meant to make him disappear into a crowd," he said. The exhibition opens Saturday and runs until Jan. 27.